5 out of 5 stars - A Game of Thrones [A Song of Ice and Fire, Book 1] , Martin, George R.R. 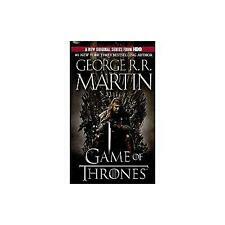 156 product ratings156 product ratings - A Game of Thrones [A Song of Ice and Fire, Book 1] , Martin, George R.R. 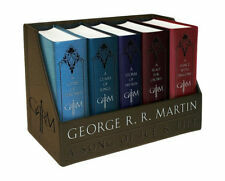 One (1) Matched Set of the First 4 (#1-4) Books in the Song of Ice and Fire Series by George R. R. Martin. The previously-owned mass market paperback books in this lot are in Good condition. All of books have been read at least once and have reading/shelf wear consisting of edge wear, corner wear, cover wear, spine wear, and/or creases. All are heading for Winterfell and a fateful encounter that will change the course of kingdoms. Winter is coming. Such is the stern motto of House Stark, the northernmost of the fiefdoms that owe allegiance to King Robert Baratheon in far-off King’s Landing. A Storm of Swords (ISBN 9780345543981): Of the five contenders for power, one is dead, another in disfavor, and still the wars rage as violently as ever, as alliances are made and broken. But young Robb, of House Stark, still rules the North from the fortress of Riverrun. Never before has the entire scope of Martin's universe been so exhaustively and fascinatingly depicted. Publication date Language of text Why should you use Wordery. Publication date:2012-10-30. Language of text:English. Snug fit designed especially for these editions. Thick walled sturdy construction. HARDCOVER EDITION, DIFFERENT ISBN NUMBER AND COVER PAGE THAN US EDITION. HARDCOVER EDITION. § Actual cover image is shown above. We would be glad to answer any of your queries. A Dance With Dragons: Part 2 After the Feast (A Song o... by Martin, George R.R. 4 out of 5 stars - A Dance With Dragons: Part 2 After the Feast (A Song o... by Martin, George R.R. 4 product ratings4 product ratings - A Dance With Dragons: Part 2 After the Feast (A Song o... by Martin, George R.R. A Dance with Dragons 1: Dreams and Dust. A Dance with Dragons 2: After the Feast. The box set includes. Give us a shot and we will make sure that you will look to us again! You're already purchasing the item. Quality Products. 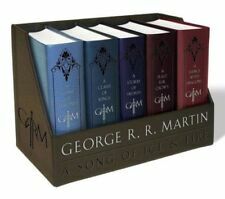 5 out of 5 stars - A Song of Ice and Fire (7 Volumes) Martin, George R. R.
8 product ratings8 product ratings - A Song of Ice and Fire (7 Volumes) Martin, George R. R.
Trending at $71.91eBay determines this price through a machine learned model of the product's sale prices within the last 90 days. A Dance With Dragons: Part 1 Dreams and Dust (A Song o... by Martin, George R.R. 5 out of 5 stars - A Dance With Dragons: Part 1 Dreams and Dust (A Song o... by Martin, George R.R. 2 product ratings2 product ratings - A Dance With Dragons: Part 1 Dreams and Dust (A Song o... by Martin, George R.R. Other works set in or about Westeros include The World of Ice and Fire, and A Knight of the Seven Kingdoms. A Dance With Dragons. A CLASH OF KINGS. Used acceptable to good condition 4 SCS - 3 large SCs and one smaller one. A Dance with Dragons (A Song of Ice and Fire) by Martin, George R. R.
4.5 out of 5 stars - A Dance with Dragons (A Song of Ice and Fire) by Martin, George R. R.
60 product ratings60 product ratings - A Dance with Dragons (A Song of Ice and Fire) by Martin, George R. R.
Trending at $9.31eBay determines this price through a machine learned model of the product's sale prices within the last 90 days. A Clash of Kings (A Song of Ice and Fire, Book 2) by Martin, George R. R.
5 out of 5 stars - A Clash of Kings (A Song of Ice and Fire, Book 2) by Martin, George R. R.
51 product ratings51 product ratings - A Clash of Kings (A Song of Ice and Fire, Book 2) by Martin, George R. R.
THIS IS A PDF OF THE BOOK NOT A PHYSICAL BOOK! A Game of Thrones (Reissue) (A Song of Ice and Fire, B... by Martin, George R.R. 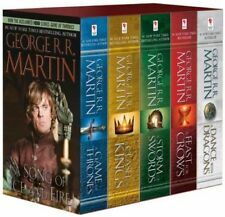 A Dance with Dragons A Song of Ice and Fire: Book Five by George R R Martin 9780553582017 (Paperback, 2013). In the east, Daenerys Targaryen, the last scion of House Targaryen, rules with her three dragons as queen of a city built on dust and death. George R.R. Martin's A Song of Ice and Fire series has set the benchmark for contemporary epic fantasy. Series Title A Song of Ice and Fire. Author(s) George R. R. Martin. Key Features. Publication Data. Used acceptable to good condition 4 SCS. George R.R. Martin. It is NOT a book club edition and is NOT remainder marked. Updated for current available copy. Near Fine Condition. The dust jacket only shows minimal wear. The binding is still solid and the pages are clean and crisp, without creases, marks or tears. All pages and covers are intact. Cover design may vary. Winter is coming. Such is the stern motto of House Stark, the northernmost of the fiefdoms that owe allegiance to King Robert Baratheon in far-off King’s Landing. A Storm of Swords, Part 2: Blood and Gold (A Song of I... by Martin, George R.R. A CLASH OF KINGS GEORGE R.R. MARTIN HARDCOVER BOOK 1999 EDITION BANTAM 1999. Condition is Good. No dust jacket. Red print spine. Shipped with USPS Media Mail. Geroge R.R. 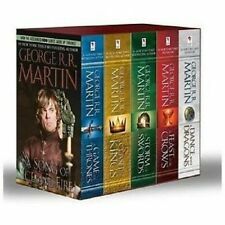 Martin's SONG OF ICE AND FIRE Series Books 1-4 (paperback matched set). A Clash of Kings. A Storm of Swords. A DANCE WITH DRAGONS. All are heading for Winterfell and a fateful encounter that will change the course of kingdoms. THIS IS A FILE, NOT A BOOK OF HARD COVER. “One of the best series in the history of fantasy.”. Fire and Blood begins their tale with the legendary Aegon the Conqueror, creator of the Iron Throne, and goes on to recount the generations of Targaryens who fought to hold that iconic seat, all the way up to the civil war that nearly tore their dynasty apart. A Song of Ice and Fire. George R.R. Martin. Dance With Dragons (good). Overall this lot is in good condition. Clash of Kings (good, has a chip out of front cover, shown in photo). This book can Be read on any Device, Computers, Apple Devices, Android, Kindle, Sony Reader, Nook Reader etc. The P.D.F format is a popular format for Electronic Books. All platforms are able to gain access and read P.D.F formatting. Game of Thrones the Graphic Novel: A Game of Thrones Vol. 2 by George R. R..... New. Shipped with USPS Media Mail. Volume One also available, with combined shipping available. A Feast for Crows Book 4 by George R. R. Martin, 2005, First Ed.